Superior drought tolerance requiring 38% less water than other varieties. Quick to self-repair means it stays beautiful longer. Its high density makes TifTuf also highly wear tolerant. Saving our water and saving our time, perfect in our Aussie climate. Genetically engineered "more for less" - superior qualities with minimal work! 6. Heat tolerant Great for our Australian climate! Its super fine leaves give it a beautiful look and make it ideal for a wide variety of applications. Less time weeding and maintaining your lawn! 10. 10-year product warranty Sit back and relax! When you purchase your TifTuf through Green Life Turf, it’s backed by a 10-year warranty! Where did TifTuf come from? 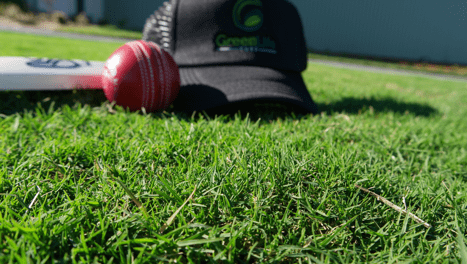 TifTuf is the product of nearly 25 years of research and development from one of the world's leading turf grass breeders, the University of Georgia in conjunction with Lawn Solutions Australia. Almost 30,000 different Bermuda varieties were being created with the search for superior qualities for our Aussie climate. TifTuf stood out to show exceptional qualities in drought, shade, and wear tolerance, and for keeping its colour for longer in the cooler months. Why did we start growing TifTuf here in Australia? TifTuf was chosen especially for the Australian climate. We began growing TifTuf in 2017 so that we would have a local supply for our Aussie landscape. How do I care for my TifTuf? A minimum of three hours direct sunlight on average per day. Less mowing than most other common lawn varieties. Without mowing too short, TifTuf can be mowed at your preferred length. TifTuf requires about 38% less water than most other common lawn varieties. Has lower fertilisation needs than most other grass varieties. 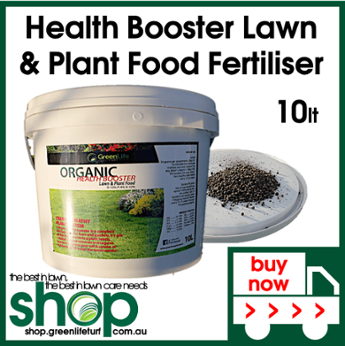 We recommend a fertilising at the beginning of spring and again mid-way through autumn. Weed resistant, you won't need to weed much, however we always recommend keeping an eye out for weeds, especially in Autumn, take care of them immediately and you’ll never have a worry! There will be minimal damage when scalped. TifTuf is also pest resistant. Again though, we always recommend keeping an eye out for signs of pests and treating immediately. What are people saying about TifTuf? What's the 10-year product warranty? for a period of 10 years from delivery or instalment*, your TifTuf will perform to its maximum potential in its new environment (subject to conditions). *if not installed by Green Life Turf, subject to following instalment instructions provided by us. It's clear we love our turf, but we want you to as well! So we're giving you the heads up on the products we recommend you use to care for your beautiful lawn. 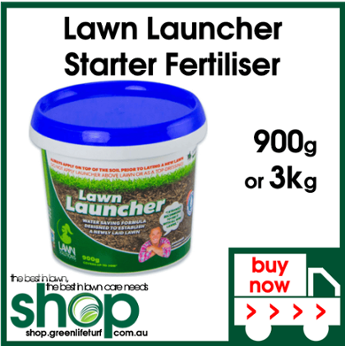 If you’re laying your own new lawn (or planting a new garden), don’t do anything without Sir Launcher Starter Fertiliser. For new lawns, rake into the top 50-75mm of your soil before laying your turf. Sir Launcher gives your new lawn the best start to its new life! Available in two convenient sizes through our online shop. We use our own special blend of fertiliser for our turf here at the Green Life Turf farm. Especially formulated for lawns and plants, it's been developed over many years. Our new, improved, best-ever formula is now available through our online shop. Because why shouldn’t you have the best too? 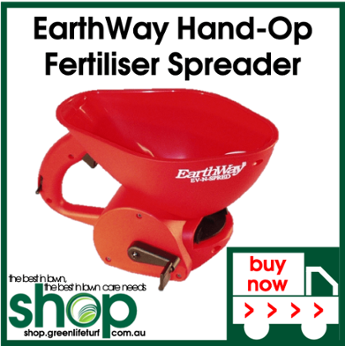 We’ve tested out a whole range of spreader products and have narrowed down our choices to EarthWay spreaders: best for design, quality, usability and value for money. We have hand-operated spreaders for small areas, and spreaders on wheels for bigger ones. Check out our range on our online shop.